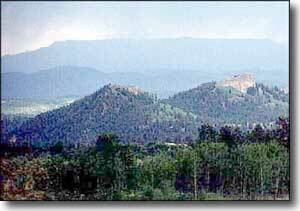 The Apishapa Road was incorporated into the Scenic Highway of Legends, a National Forest Service and Colorado Scenic Byway, on September 29, 2001. The road begins in Aguilar and heads west out of town through Gulnare and up along the Apishapa River Valley to the San Isabel National Forest. 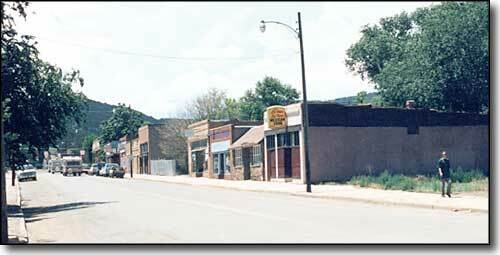 The Scenic Byway follows Main Street in Aguilar west to the end of the business district and then turns left. Stick with the pavement and in 8 miles you'll be in Gulnare. Along the way to Gulnare, you'll pass the roads leading northwesterly into Mauricio Canyon and Trujillo Creek Canyon. As you approach Gulnare you'll notice that the trees are changing: as the elevation rises the pinons and cedars give way to Ponderosa pines. You'll also begin to see more wildlife. Gulnare was a farming and ranching community for many years, selling their meat and produce to the coal miners around Aguilar, and points north and south. But when the mines were all closed, that market fell out and most of the folks headed for jobs in the cities. Gulnare today is almost a ghost town, although a couple of 35-acre subdivisions have brought more people back into the area. The old Gulnare Public School is still standing but these days, school children are bused to the schools in Aguilar. Along the way westward, there are many vistas that include the Spanish Peaks. This one is from just north of Gulnare. As you travel further west, the terrain gets more rugged with deep canyons cut in the layers of sandstone and with many spectacular rock formations on display, formations carved by wind and water over the millenia. Also, as you get closer to the Peaks, you come across more and more of the granite dikes. And there are more and more critters along the way. 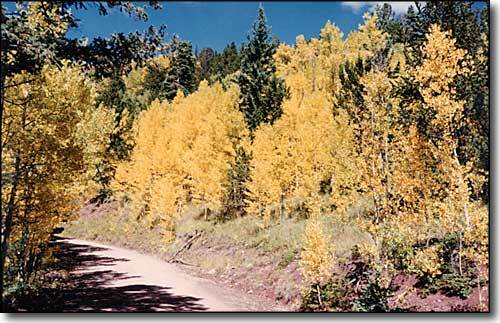 Between Gulnare and Twin Peaks Ranch, the road is only a couple miles north of the Spanish Peaks State Wildlife Areas. While there's usually lots of elk and mule deer and the occasional black bear to see, the real thing to look out for is the fork in the road just west of Gulnare. If you go left you'll be traveling up Jarosa Canyon and crossing the ridge as the road goes south onto Wet Canyon Road, about 18 miles north of Weston and the Scenic Byway between Trinidad and Stonewall. It's a beautiful drive but it's not part of the Scenic Byway. If you go right at the fork, you'll stay on the Scenic Byway and eventually reach Cordova Pass and the paved portion of the Scenic Byway at the summit of Cuchara Pass. Watch for the signs. Traveling west you'll soon see signs letting you know that you are crossing Twin Peaks Ranch. 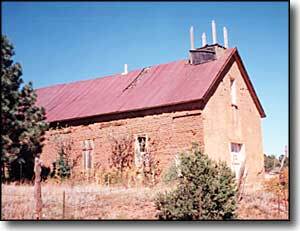 They are a large cattle and hunting ranch directly abutting the south side of San Isabel National Forest near the East Spanish Peak. The views here just get bigger and bigger. You also cross that 8,000-foot threshold and come into aspen and spruce territory. At one point you'll pass through a large dike wall and find yourself in a gorgeous valley. Looking back (to the east) you'll see the Twin Peaks Dike, with the ranch headquarters just below it. This dike is exposed for miles, sticking out above the surrounding countryside. Shortly after passing Twin Peaks Ranch you'll see a sign on the right saying "Entering God's Country." That signals the beginning of the Spanish Peaks Ranch. 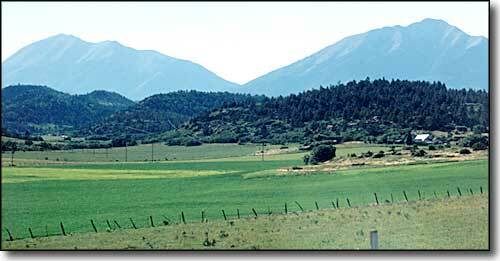 The next sign of the ranch is a white, concrete arch over one lane of the road proclaiming "Spanish Peaks Ranch." A little further is a set of mailboxes for the ranch and then the road heads straight into San Isabel National Forest. In the winter, the county only plows the road to just past those mailboxes. From that piled-up snowbank on, the road may not be open again until the end of next May.